A well meaning husband is pressured by his beautiful marksman wife to go on an interstate robbery spree, where he finds out just how depraved and deadly she really is. Touted as a precursor to 1967’s classic Bonnie & Clyde, 1950’s Gun Crazy introduces us to Bart Tare (John Dall), a man who digs him some firearms. When he meets sharpshooter Annie Laurie Starr’s sideshow act, it’s love at first gunsight. After the two marry, Annie finds herself dissatisfied with their financial situation. To rectify this circumstance, Bart and Annie become bank robbers and embark on a spree of increasingly violent escapades. When I saw the credits for Crazy, I admit I felt some skepticism about its potential quality, as the film lacks participants who made much of a dent in cinema history. Though Dall appeared in a few well-known flicks like Rope and Spartacus, he remains largely forgotten, and no one else involved mustered many notable credits. Perhaps there’s a good reason for that: no one here displays a ton of talent. While Crazy manifests a clear level of competence, it never sparks to life in a way that would turn it into something above average. Of course, the comparisons to Clyde set up Crazy for failure, as it can’t compete with one of the all-time classics. Even if I ignore the similarities, though, the earlier film still comes up lacking. Honestly, without the connection to Clyde, I suspect Crazy would maintain less of a position in film history. Though not without occasional positives, the movie seems muddled and spotty. Crazy gets better as it goes – faint praise, as its opening act lacks much real purpose. The film’s first segment focuses on young Bart’s obsession with guns and goes precisely nowhere. Actually, the beginning becomes a negative, as it sets up Crazy down a path it largely ignores. Yeah, we do see Bart as a kid hung up on firearms as well as one who refuses to kill, but these elements add up to nearly zilch in the long run. That’s because the film could just as easily convey this information without the view of adolescent Bart. Whatever it does to set up themes and characters feels superfluous, as the development brings no real depth to the subsequent proceedings. Once we catch up with adult Bart, Crazy improves somewhat, but it lacks a lot of purpose. The story traces lackluster character and story developments without enough sizzle or panache to create intrigue. We just don’t get enough insight to bring out life in the characters, and the dramatic movement fails to contribute real drama or spice. Do we care what happens with Bart and Annie? Not really, and that leaves their journey as one without much inspiration. The action sputters as well, for the crime spree never seems especially vivid or engaging. This means we simply follow two flat characters as they bop around without enough rhyme or reason to draw us into the narrative. I won’t claim any of this makes Gun Crazy a bad film – as noted, it presents a competent affair. I just don’t think it ever becomes better than that, so it winds up as a forgettable noir effort. 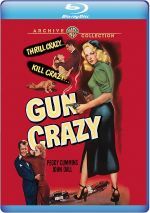 Gun Crazy appears in an aspect ratio of approximately 1.371 on this Blu-ray Disc. This became an inconsistent image but it accurately reflected its source. And to be fair, the movie usually looked good, as sharpness appeared nicely tight and distinctive most of the time. Any softness stemmed from the original photography, as some components – largely process shots – caused some ill-defined material. Despite those, most of the movie appeared pretty concise, and no issues with shimmering or jagged edges occurred. Even the film’s advanced age, source flaws were minor, so this was a clean presentation. A good layer of grain manifested, so I didn’t suspect significant noise reduction. Contrast was strong, as the movie consistently maintained a nice silver tone. Blacks were deep and firm, while shadows were smooth and well-defined. Again, the original production created some lackluster elements, but most of the image seemed appealing. In addition, the DTS-HD MA monaural soundtrack of Crazy also worked fine. Speech seemed reasonably accurate and distinct, with no issues related to intelligibility or edginess. Music came across as fairly bright and lively, though dynamic range seemed limited given the restrictions of the source. Effects showed good clarity and accuracy within the confines of nearly 70-year-old stems. This was a more than adequate auditory presentation for an older movie. In terms of extras, the set includes an audio commentary from film historian Glenn Erickson. He presents a running, screen-specific look at the source text and its adaptation, story and characters, cast and crew, themes and interpretation, and various filmmaking elements. Erickson manages a pretty good commentary, as he touches on an appropriate array of subjects. He adds to our knowledge of the film in this consistently informative and engaging track. A documentary called Film Noir: Bringing Darkness to Light fills one hour, seven minutes and 37 seconds. It includes notes from Erickson, novelist James Ellroy, author Kim Newman, writer/performer Henry Rollins, composers Andre Previn and Graeme Revell, cinematographers Newton Thomas Sigel, Roger Deakins, John Alton, Gordon Willis and Janusz Kaminski, filmmakers Sydney Pollack, Edward Dymtryk, Paul Schrader, Christopher McQuarrie, Nicholas Pileggi, William Goldman, Brian Helgeland, Christopher Nolan, Lili Fini Zanuck and Frank Miller, film archivist Haden Guest, historians Patricia King Hanson, Alain Silver, James Ursini, Eric Lax, Drew Casper, Rick Jewell and Eddie Muller, editors Peter Honess and Carol Littleton, composer John Debney, and actors Talia Shire, Jane Greer, Theresa Russell, Michael Madsen and Audrey Totter. “Light” examines the defining characteristics of film noir along with the genre’s origins and development, frequent themes, cinematography, music, editing and stylistic areas, and connected domains. “Light” delivers a nice overview that provides lots of information about noir. 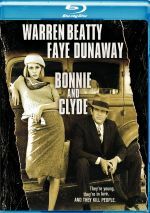 As a precursor to Bonnie & Clyde, 1950’s Gun Crazy provides historical interest. As a film on its own, though, Crazy seems thin and forgettable. The Blu-ray brings us generally positive picture and audio along with some informative supplements. Crazy ends up as a mediocre noir effort.